I got a call from my littlest sister, Naomi last week. The most adorable pregnant lady, ever. She’s down to the last few weeks of her pregnancy and as you can imagine, wishing the baby would hurry up and get here. Ever the organised gal, she had run out of things to prepare. Apparently the nest is complete. But she mentioned some friends had suggested she cook up a few easy meals, to keep in the freezer for when she gets home from the hospital. Did I have any ideas? So Nai-Nai, here you go. Can’t wait to meet the newest little addition to the family. Bring on the newborn cuddles! This recipe dates back to my pre-5 ingredients days, but it’s still one of my favourites. You could make this in advance and freeze if you like, but it’s also pretty low maintenance to make. Just halve an eggplant and bake with some tomato until soft. Serve with pesto. Just as delicious as pumpkin soup, without the need to use lots of energy peeling pumpkin. I love this soup. Another favourite set-and-forget recipe, this also freezes well. Just serve this simple curry with finely grated fresh cauliflower or steamed rice. And of course, adjust the chilli to a new-mother-appropriate level. These roast mushies are super versatile. From a mushroom sandwich, to a veggie alternative to steak. Also great in warm salads with some lentils. Another one that you could make in advance and freeze, or keep in mind as a set-and-forget meal. Feel free to play around with the veggies, although the roast parsnips are rather hard to beat. If the meat balls, below don’t grab you, maybe their vegetarian cousins would hit the mark. Cook these burgers and freeze individually. Reheat in the oven straight from the freezer and serve with a simple salad and the yoghut sauce. While you’re over there, the tips on freezing food may be useful as well. A wonderfully hearty soup. Great little meal in a bowl. An oldie but a goodie for when you might be in the mood for something a little French. Perfect for while the weather is still cool… or for you Northern Hemisphere readers, for when autumn comes around. The thing I love about these meatballs, apart from the fact that they taste delicious, is that you just pop them in the oven and leave them to cook away. No messing around trying to brown them in a pan and risking ending up with meatball mush. I prefer to use almond meal, rather than breadcrumbs to keep the meatballs gluten-free but still retain the lovely soft texture you get with breadcrumbs. Of course if you’d prefer to use bread crumbs, you can, just soak them in a little milk to soften before using. And the onion step is a pain, but it really adds to the meatball flavour. If you’re in a hurry, you could skip the onions and it won’t be the end of the world. I’m using a mixture of pork and veal mince I picked up from the butcher, but feel free to play around with the type of meat you use. Beef is lovely as is pork or veal on their own. Chicken would take the meatballs in another direction. 1. Preheat oven to 200C (400F) and a small frying pan on a medium heat. 2. Add a glug of olive oil and the chopped onion to the frying pan and cook, stirring from time to time, until just soft and golden. About 5 minutes. 3. Place tomato in the base of an oven proof dish. And combine meat and almond in a bowl. Season. 4. Add the softened onions to the meat and mix to combine. Using your hands and a tablespoon, form the mixture into little meat balls no larger than a golf ball. Placing them on top of the tomato as you go. 5. 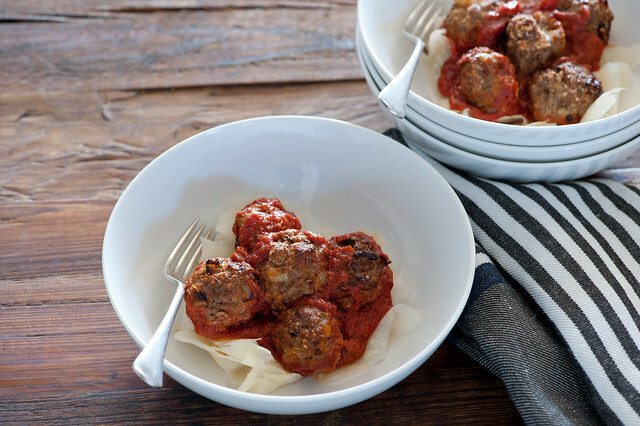 Scatter pieces of butter over the meatballs and bake for 30 – 45 minutes or until browned on top and cooked through. This my new favourite grain-free pasta substitute. I just love the flavour and texture of celeriac ribbons. Oh so similar to parpadelle but much lighter. The only downside is that it takes a bit of elbow grease to make the ribbons using a vegetable peeler. But for me it’s worth the effort. 1. Bring a medium saucepan of salted water to the boil. 2. Using a knife, remove brown husky skin from the celeriac. Then use a vegetable peeler to shave wide ribbons. 3. Simmer celeriac for 3-4 minutes or until tender, drain. Gosh, I’m in the same situation! I’ll definitely be bookmarking this and starting to stock up! This is awesome! A few times recently I’ve wanted to provide some meals for a family (usually after a birth or a death) and been stuck for what to cook. I’m a vegetarian, and while I have no objection to cooking meat for other people, I just have no idea how to do it. I’m picturing it wouldn’t be very hard to cook up a Simple Sausage Supper, and it looks delicious. My partner’s sister is due to give birth in November – maybe it will be salad weather by then, but perhaps she will brave the heat if I cook her favourite lamb shanks! Thanks Jules for this great resource. Great ideas! I love preparing food in advance – you never know when you’ll need it. Veal? I hope you’ve looked into what the calf’s life is like before you eat it. Perfect timing – am cooking number four and with a husband that travels a lot for work, low maintenance or prepare in advance food is a necessary factor at the moment. In fact am about to poach some sausages for a speedy after swimming lessons supper :-). Congratulations on yr impending nephew/niece! I’m expecting my third and forth (argh! At the same time! ), and this is something I’ve done a whole lot of practical research into- if you’re cooking for a new Mum and family, make things you can eat with one hand, no knife, and that don’t drip. If they’re going to nurse, things with TONS of calories. Hand pies would be great. Lots of muffins. Stromboli. Vegetable casseroles. Make really good ragu or mushroom stroganoff and freeze in small portions. Do pureed vegetable soups that she can drink out of a mug- the above carrot soup would be perfect. Creamy potato and cheese and onion. Tomato bisque. Gazpacho if it’s going to be hot. Prepared food is a godsend for the first few weeks. Thank you for the great recipes. 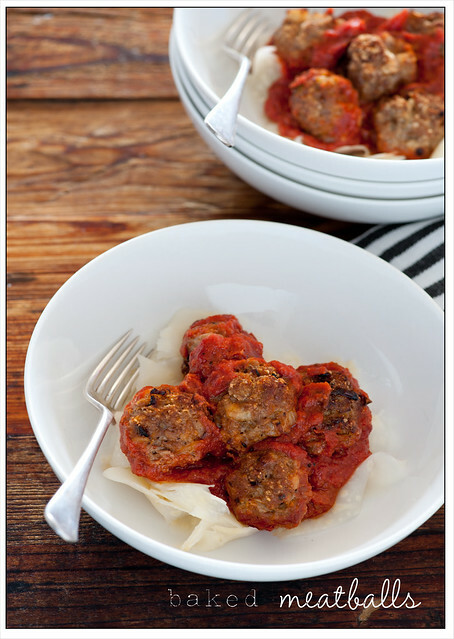 What a great idea baking the meatballs in a bit of sauce! I have baked mine a few times on a sheet pan and there is always and unpleasant kind of liquid that forms underneath them and they never properly brown so I always end up frying them. Just a warning, I wouldn’t load up too heavily on the beans and cruciferous veggies if you’re planning to nurse! Some babies just don’t tolerate them well–can give them horrible, painful gas. I wouldn’t fill my freezer with only that stuff just in case your little one is one of the intolerant. My son didn’t seem to mind, but my nephew would be in serious pain whenever my SIL had even a tiny bit of broccoli or beans. But otherwise prepared food is so helpful! If a mom is nursing, she’ll be HUNGRY a lot at first. I prepared a bunch of little snack foods like homemade granola, muffins, nuts and dried fruit mix, etc. I would leave a giant bottle of water and a generous snack by the chair I used for nursing and would stuff my face in the middle of the night because I was so ravenous. Your body needs extra fuel as it’s adjusting to making milk! I also made some preportioned fruit smoothie packs and froze them, so all I had to do was dump into a blender. They were perfect for refueling while holding the baby in one arm, and they satisfied my major craving for fresh fruit. You just can’t beat having a homemade meal ready to pull out of the freezer when you’re still getting the hang of the newborn thing! Those recipes sound delicious but as a breastfeeding mum with a dairy intolerant & refluxy baby I can say that I would not have been able to eat many of them in the first 10 months. I had to steer clear of all spices (including cinnamon & chocolate) and gassy foods like beans, dried peas, legumes, onions, garlic, sausages were a no-no as well. Even eating reheated vegie soup could be problematic at times. Fail safe foods: roast vegies in plenty of oil, stew (no onion or garlic – celery makes a good substitute), spaghetti (no onion or garlic), fish & chips, roast pumpkin risotto (no onion, garlic or dairy), rissoles and steamed vegies. As for snacks, porridge and cereals were a great pick-me-up with rice milk. What a good big sis with the creative suggestions for make a head meals! Those first few weeks after baby joins the family can be hard (especially because of the lack of sleep!). It is comforting to have a delicious and easy dinner to look forward to. Baking in sauce is definitely the way forward! The almond meal is really interesting. I wonder how it would affect the flavour I you toast them before adding. The almond meal is in there more for flavour than anything else. To be honest I don’t think toasting the almond meal first would be that great because it would detract form the meaty flavours. But then I could be wrong… only one way to find out! Your meatballs look great, hope mine turns out like yours :) am bookmarking your site, need to come back for more. Great pics. I’m expecting my first little one in early October and a good friend sent me the link to your post…we’ve just invested in a little upright freezer for the very purpose of preparing a few meals for the early weeks. I’ve never been much of a freezer of meals, so am a bit hopeless at knowing at what point should the meals be frozen….Is it best to cook ready to eat, then freeze? I think most things are best if you cook, cool and freeze ready to eat. Looking at the list above, that’s what I’d do for pretty much all the suggestions. Oh wow, I was wondering what those “noodles” were – I thought it was just strips of parmesan! 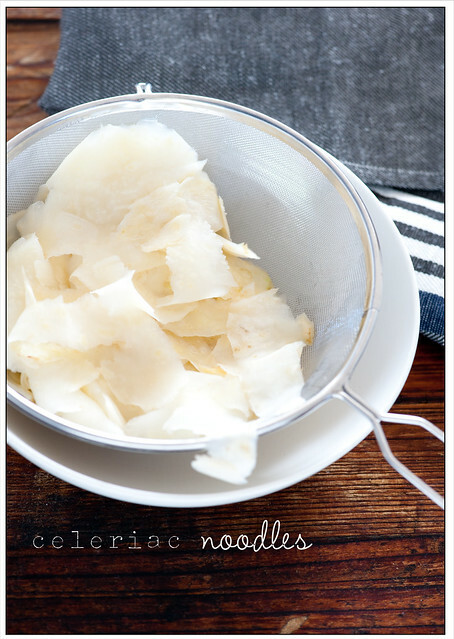 Celeriac, awesome idea. Everywhere I turn lately people are popping out babies – winter is the time to get cosy with your loved one, apparently! What a perfect post. Thanx Jul! Soups are a great idea. I didn’t make any of them. That can be tomorrow’s job. Who knew coq au vin was good for labour? This is a simple yet gorgeous recipe, I tried the meatballs at the weekend and couldn’t get over how easy it was!